Over $325 Billion was spent on advertising globally last year. Bunz believes that people should own the value of their personal data and that brands will pay people for access to that data. Welcome to the sharing economy where data is the new oil – what Airbnb did for accommodation, and Uber did for transportation, Bunz is doing for your personal data and time – rewarding you with BTZ for your attention and contribution to a networked community. Bunz first launched as a social platform allowing users to trade stuff with each other – my lamp for your carpet. A cashless barter transaction between humans is on the right side of the planet’s sustainable agenda when it comes to reusing “our stuff” and generating less waste and landfill. Founded in 2016, ironically as a secret Facebook community, the Bunz app has now completed over one million trades and can be found in every major city across Canada, as well as in growing pockets around the world – including Australia, the UK, the US, and Japan. “We were excited to partner with Bunz as we’re always looking to explore new, innovative ways to reach consumers. 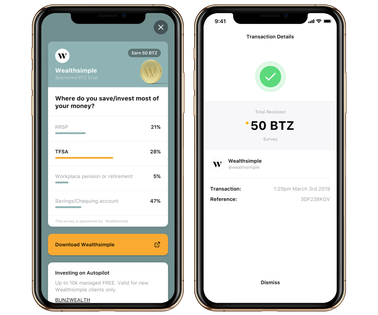 What really appealed to us about the Bunz platform is how transparent it is – users know exactly what information they’re providing, and to whom,” said Kate Chippindale, Partnerships Lead at Wealthsimple. Sascha Mojtahedi: Bunz came about because we all have too much stuff – it is a simple and fun way to post something you aren’t using anymore and get something you need in return while meeting some amazing people locally. As the number of barter trades approached one million in 2018, we realized we would need a currency to solve the classical economic issues that prevent bartering from scaling, the “double coincidence of wants”. The thing that makes BTZ special is that people can’t buy it – they earn it for their data, attention, and contribution to the Bunz community. The current social contract with platforms like Facebook is broken – you use their platform for free while they monetize your data for their profit. We created an alternative to traditional data monetization and advertising that serves people first. Facebook and other platforms have faced a lot of backlash for their exploitative data practices, and brands who pay these platforms are making that exploitation possible. BTZ represents an alternative. Brands care about their customers and want to do right by them – they just didn’t have the opportunity before Bunz and BTZ. Mojtahedi: Platform features are becoming ubiquitous – it’s washed out and nearly all of them offer something similar. You can expect Bunz to have the same features that the rest do but with the pay people not platforms mentality. Anyone, anywhere in the world can join by downloading the Bunz app today, start earning BTZ and get trading with their local community. The launch of shops that accept BTZ is based on where the community is growing the fastest. So invite your friends – the faster your community grows, the sooner we will be launching shops for you to spend your BTZ! Mojtahedi: What keeps me up at night is ensuring that Bunz creates a more sustainable future for everyone – economically, environmentally and socially. We are at an inflection point in history – we know what we are doing is not sustainable and needs to change. We believe there is a solution through better value distribution, by connecting people in meaningful ways and by reducing waste via better distribution of goods locally. I spend most of my time thinking about more ways to distribute value derived from data, attention, and contribution to a network back to the people that make it valuable.